The designers at Brooklyn-based firm WeShouldDoItAll (WSDIA) were tasked by Nike with the extraordinary job of designing a case for NFL pro athletes in two days. 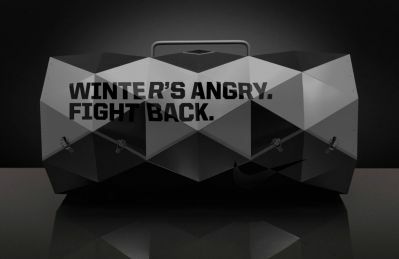 With help from fabricators from the Guild, they created a premium cold weather case that included Nike products across the athletes training continuum. The athletes included; Darelle Revis of the NY Jets, Justin Tuck of the NY Giants, LeSean McCoy of the Philadelphia Eagles, Wes Welker of the New England Patriots, Mike Wallace of the Pittsburgh Steelers and Ray Rice of the Baltimore Ravens. Nike also hosted a contest in which one football fanatic would receive the same case as the premium players involved. The designers chose Charcoal Gray Dibond aluminum composite material (ACM) due to its flexibility and durability in design. The use of dark metal on the duffle showcases the strength and power associated with the National Football League and Nike athletes. As a material primary used in exterior signage it is astonishing to see such an innovative and creative use of Dibond ACM.